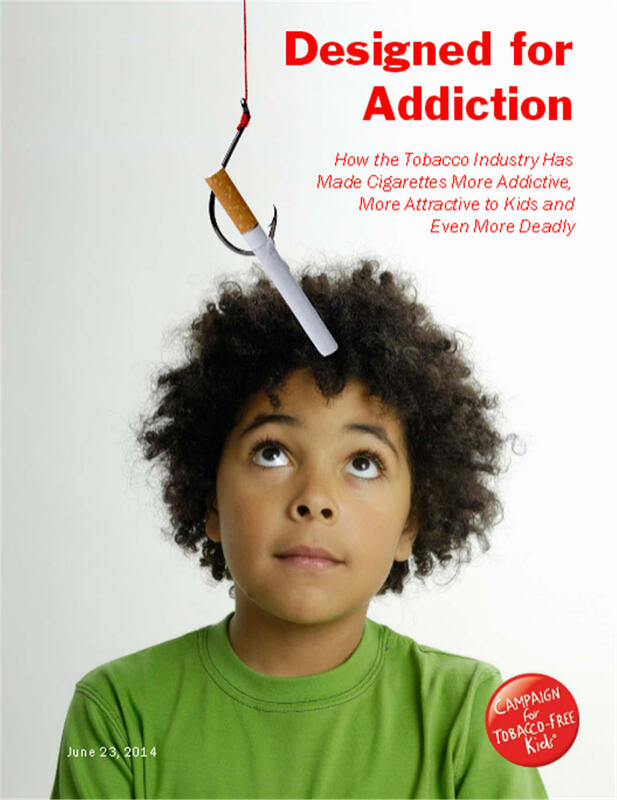 The report, titled Designed for Addiction, details how tobacco companies purposely design cigarettes to make tobacco smoke smoother, less harsh and more appealing to new users, especially kids, and to create and sustain addiction to nicotine. 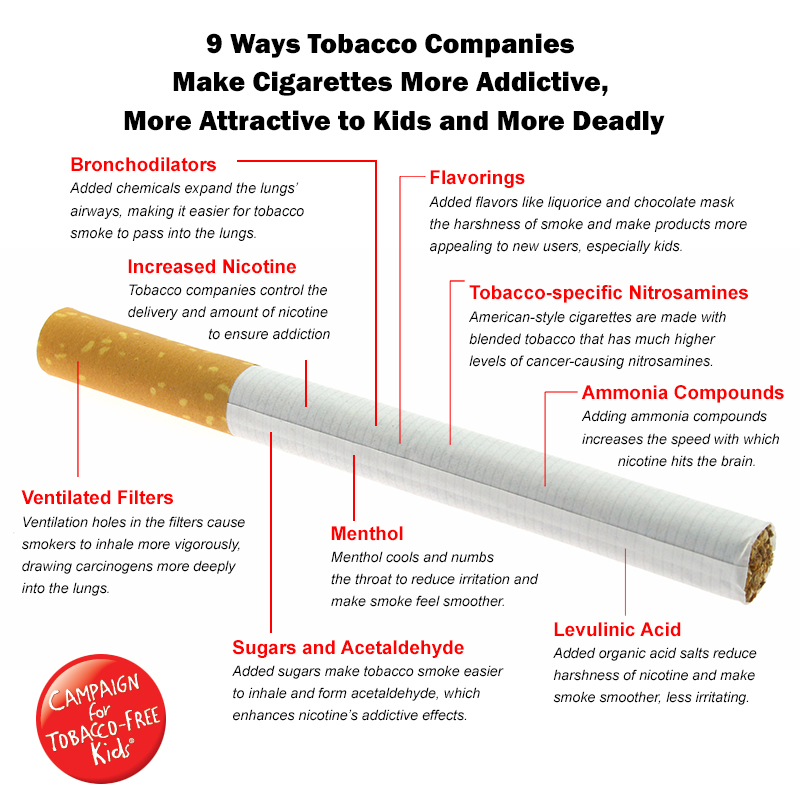 Tobacco companies have made these changes without regard for the health impact and actually have increased smokers’ risk of developing lung cancer. While the United States has made enormous progress in reducing smoking, tobacco use is still the nation's number on cause of preventable death. Smoking annually kills 480,000 Americans and costs the nation at least $289 billion in health care bills and economic losses. Ammonia: Added ammonia compounds produce higher levels of 'freebase' nicotine and increase the speed with which nicotine hits the brain. 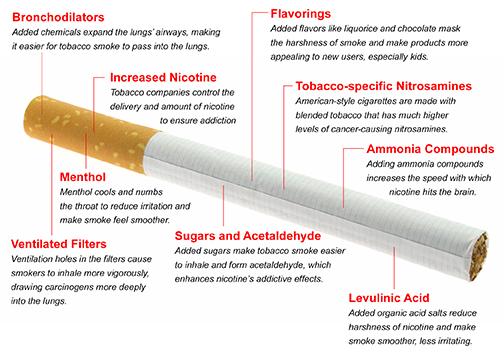 Flavorings: Added flavors like licorice and chocolate mask the harshness of the smoke and make tobacco products more appealing to young people (the 2009 tobacco regulation law prohibited cigarettes with 'characterizing flavors' other than menthol, but did not prohibit the use of flavorings at levels not considered to be characterizing). Bronchodilators: These added chemicals expand the lungs' airways, making it easier for tobacco smoke to pass into the lungs.